The median restaurant startup cost was $375,000. This equates to a median cost of $113 per square foot, or $3,586 per seat. Many factors affected cost including remodel vs. new construction, free standing building vs. tenant space, and whether the restaurant was full service, limited service, bar or tavern, catering business, or takeout and delivery. “New construction was more costly than remodeling. The median cost of building a restaurant from the ground up, not including real estate, was $650,000,” said COO Joe Erickson. Remodeling a non-restaurant space was the second most costly, with a median cost of $425,500. 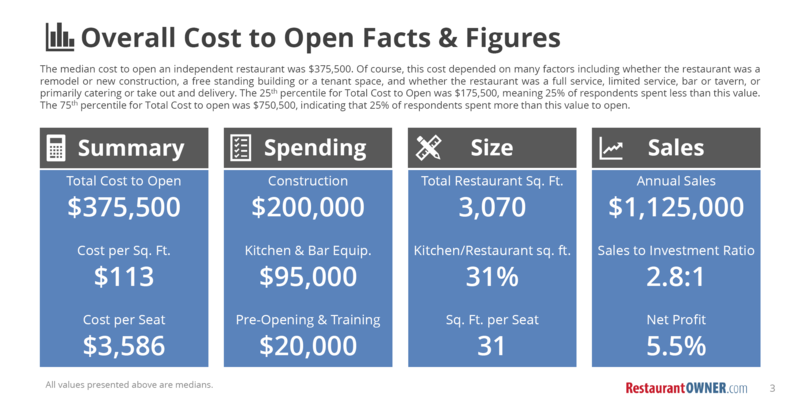 Remodeling an existing restaurant space was the least costly, with a median cost of $275,500. Consequently, the median sales to investment ratio was highest for remodeling an existing restaurant space (4.2:1), versus either remodeling a non-restaurant space (2.1:1) or new construction (2.0:1). The median size of restaurant startups was 3,070 square feet, and 120 seats. This size resulted in a median of 31 square feet per seat. Kitchens occupied about 31% of the restaurant space, with a median size of 1,000 square feet. The median annual sales across all service types was $1.125 million. That financial performance resulted in a median annual revenue of $325 per square foot, or $10,567 per seat. Median time to profitability was 5 months. 25% of owners reported that their restaurant was profitable within the first 2 months and another 25% took 12 months to become profitable. The median net income reported was 5.5%. RestaurantOwner.com provides leadership, financial management and operational training and resources to independent restaurant owners and managers to improve the guest experience, employee engagement and achieve better financial results. *Image Caption: page three example from the comprehensive 2018 report. "New construction was more costly than remodeling. The median cost of building a restaurant from the ground up, not including real estate, was $650,000," said COO Joe Erickson.